If you are planning your wedding in Durham, you have come to the right place! North East Wedding Band Funk Conspiracy are here to tell you all about the North East’s charming, historic cathedral city - Durham. Ease some of your wedding woes by using this page as a guide to Durham’s finest wedding venues, hotels, restaurants and top visitor attractions. Book Funk Conspiracy as your Durham wedding band, we provide a professional service and create a fantastic atmosphere that your guests will relish and will turn your special day into a dream come true. Now relax and use our definitive Durham wedding guide to ensure everything falls into place…..
Durham is well known for the magnificent Durham Cathedral and 11th century original Norman ‘motte and bailey’ castle, Durham Castle, both of which are World Heritage Sites and Grade II listed buildings. 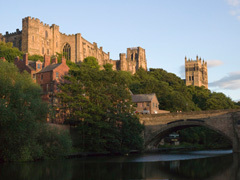 Since 1832, the castle has been the home of Durham University. Historically, the geographical position of Durham meant it was in a prime position in the defence of England against the Scottish. Durham played an integral part in the defence of the north and Durham Castle is the only Norman Castle Keep never to have suffered a breach. The cathedral has an absolutely stunning interior, and you can understand why it is regarded as one of the finest Romanesque cathedrals in Europe. Steeped in history, Durham Castle is the perfect venue for your Durham wedding. The website even lists available dates and with a fee of only £995 for key summer wedding dates, it is affordable too. Beamish Hall is in a relaxing, rural setting, conveniently situated close to the A1. The 4 star country house hotel is set in 24 acres of wooded parkland in the picturesque village of Beamish. As a winner of The north of England wedding awards 2012, Funk Conspiracy are proud to be a listed supplier of Beamish Hall, where we can help turn your special day into a dream come true. 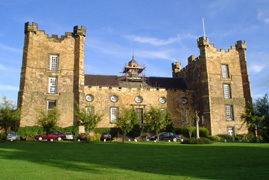 Lumley Castle, a luxury 4 star hotel, has been standing for 600 years in the Durham landscape. Lumley Castle is set in beautiful parklands that boast stunning views of the River Wear and Durham County Cricket Ground. With magnificent State Rooms and sumptuously decorated intimate dining rooms, Lumley Castle never fails to impress. Hallgarth Manor is a former 16th century residential estate, set in 4 acres of spectacular grounds and beautiful landscaped gardens. The venue has been discreetly modernised and retains many of its original features. Ramside Hall Hotel and Spa is the North East's largest luxury privately owned hotel in Durham. Ramside Hall was once the home of the Pemberton family, and it was developed into a hotel and golf complex in 1963. It is surrounded by a 27 hole championship golf course and set in lovely gardens. The hotel has 80 rooms with elegant and charming décor. If you are planning a more modern Durham wedding, go for the Radisson Blu Hotel. It is a sleek and modern hotel in the heart of Durham city. The Filini restaurant serves contemporary Italian cuisine with wonderful views of the city. The 4 star hotel has 27 stylish rooms and suites, making this a superb wedding venue that oozes class and character. 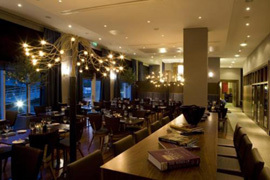 La Spaghettata is a great Italian restaurant situated on the road up towards the cathedral. With reasonably priced but high quality food, the restaurant is located upstairs to Fabio’s, a smart and sophisticated bar. A good choice for a nice meal and a few drinks after! Finbarrs serves locally sourced food in a chic and contemporary setting. With an extensive wine list to suit all tastes and dishes, Finbarrs ensures a dining experience to exceed your expectations. If Indian cuisine is more your thing, head to Spice Lounge. It is proud to serve delightful food from all corners of India. Or try Oldfields for some staunchly British, locally farmed, seasonal produce that’s cooked simply and well. The Funk Conspiracy Durham wedding guide was written by Navella Caretto.